Well, here we are. 2011. Is this going to be the start of a mega-crafting year for me I wonder? I would like it to be, but, knowing myself as I do, I will probably spend much of the year procrastinating. Does it count if you read about crafting? I do lots of that. I love to sit and read about all the wonderful projects I could start, then plan what fabric I’m going to use and when I’d wear or use said completed project. And then I don’t actually do it. I’m a bit rubbish that way. I need to be poked with a stick to actually get something done. Which leads neatly to my latest project ……. I poked myself with a stick for this one. 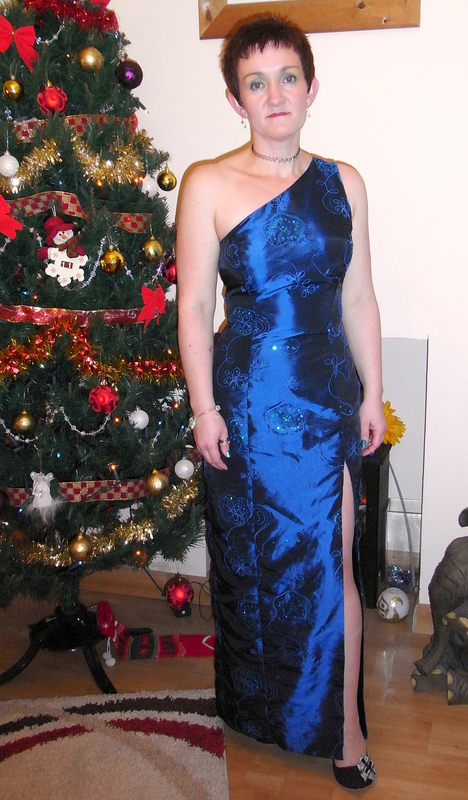 I wanted to make myself a dress for my work Christmas “do”, so to make sure I actually started (and finished it) I told everyone in work that I was GOING TO MAKE MY OWN DRESS. They were suitably impressed which meant I had to pull my finger out and get on with it! 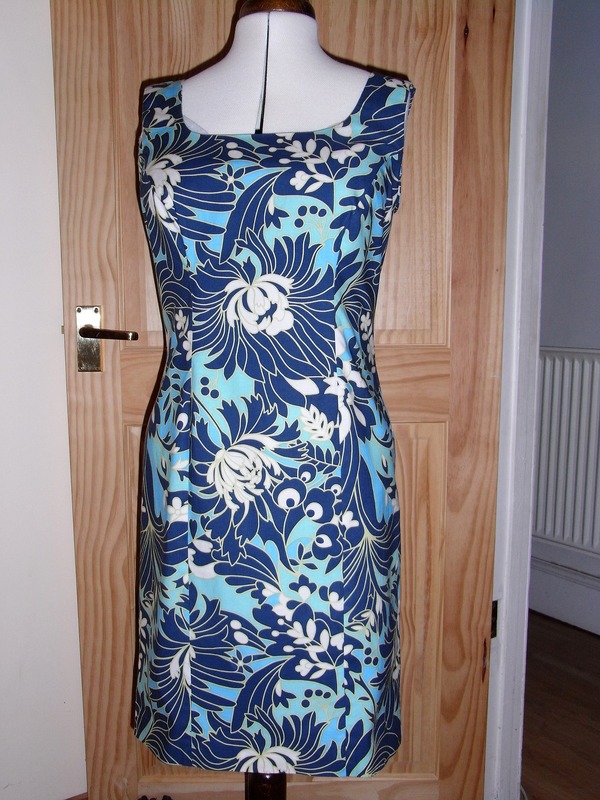 The pattern I chose was Butterick 4343. I’d seen Tess Daly sporting something similar in “Strictly” a few weeks earlier and she looked fab in it (I however am not Tess Daly but I didn’t let that minor point bother me!). As the pattern claimed to be “Fast & Easy” I thought I’d give it a go. Well, it was neither fast nor easy but I rather suspect that the problem was more to do with my lack of expertise than the pattern itself. I needed to make a Full Bust Adjustment in order to contain my ample bosom which took a couple of attempts with a toile. Got there in the end though. I’d bought some lovely fabric online from Fabricland – “Can Can” taffeta in Shot Peacock colour. They also supplied me with the lining, zip and thread for a grand total of £17. Bargain! Making the dress went without too many hitches (although I did manage to cut the lining out the wrong way round and stitch it to the dress back to front!). After a lot of huffing and unpicking I managed to sort that out. Everyone in work got a blow-by-blow account of how the dress was coming on (whether they wanted it or not) bless them, and I managed to finish it with two whole days to spare! I’m sure you’re all desperate to see the finished result aren’t you? Here it is – drum roll please – Tada!! At last! I’ve finally made a version of New Look 6207 that I’m happy with. I’ve altered the shoulders slightly so that the back lies (almost) flat. I’ve worn it in public and I felt comfortable in it. Success! I’m feeling pretty down about my abilities as a dressmaker. This morning I felt pretty positive but my emotions with regards to sewing are like a roller-coaster. Why do I feel so miserable? This is the culprit .. It looks ok on the dummy but when I wear it the back gapes out. It wouldn’t feel so bad but it’s actually the third time I’ve made it – I made two “test” pieces before cutting into the actual fabric and thought I’d altered it properly. The problem lies mainly with my bust – I’m a DD cup. The first attempt I cut the top in a size 14 and graded the skirt section down to a 12. I sure those of you experienced in alterations know that that wasn’t going to work – it fit across my bust but nowhere else . My second attempt I cut the pattern out as a 12 and then added a little at the bust seams. 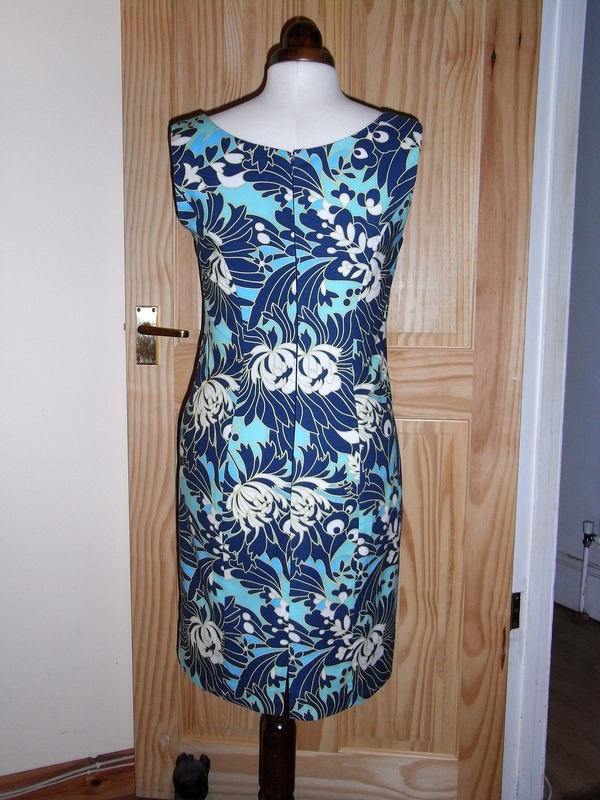 On the test this seemed to work but for some reason on the dress proper the back still gapes. I can’t work out what to do about it. Do I take a little off the zip edge seam or do I cut it in a 10 and add more to the bust? Or do I just not bother? Give up? Admit defeat? I sometimes feel that I should just give up and find a new hobby. I love sewing but I rarely seem to be able to make things fit properly. I’m not really going to give up of course but I worry that I’m never going to be as successful as my heart wants me to be. Ooh, I almost forgot! I finished my pinafore on Wednesday night. I was really pleased with the finished result (that’s got to be a first!) and I wore it to work on Thursday. I got some very positive comments and a couple of the girls even suggested I make some for them! I’ll get Kev to take some pictures and get them posted. Before I start on a new project I’m going try and finish off a couple of things I’ve already started. My velvet skirt just needs hemming so that shouldn’t take long, but the velvet corset top – that’s a different matter altogether (do I have a velvet fixation? I think I probably do..). It’s been thrown in a bag, half finished, for the best part of a year now. I’d really like to get it finished as it’s such a pretty design, but it’s just soooo difficult! I’ll take some pics of that too so that I can show you.